2018 Collegiate Championships a Success! 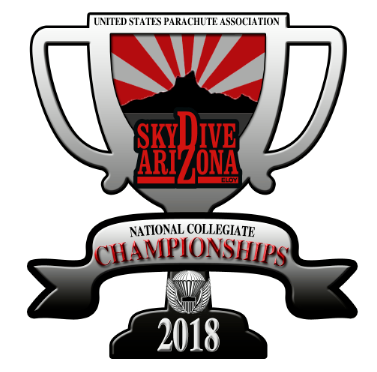 The 2018 USPA National Collegiate Parachuting Championships wrapped up Wednesday, January 2, at Skydive Arizona in Eloy. The competition, the longest-running skydiving competition in the U.S., drew 73 college skydivers from 13 schools across the U.S. As always, the U.S. Military Academy at West Point and the U.S. Air Force Academy were well represented, as were the U.S. Naval Academy and University of Connecticut. Students also competed from Dartmouth, Georgia Tech, MIT, Tufts University, UMASS Amherst, UMASS Lowell, University of Arizona, Virginia Tech and Western Michigan University. Despite some clouds, rain and frigid temperatures, the competitors completed at least the minimum number of required rounds in all events. In addition to capturing the gold medal in 6-way speed, AWP Scheme Team 6 also set a USPA national record in round two, completing the “snowflake” formation in 8.56 seconds. Complete scores are available on Omniskore.com, and photos are available in the USPA Facebook Album. Look for a complete report in the March issue of Parachutist.